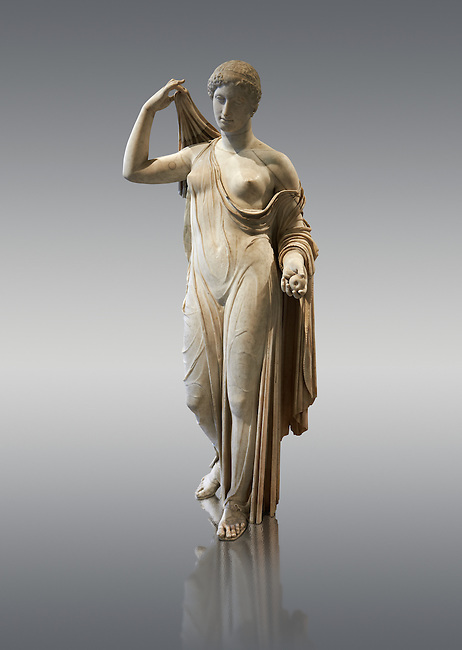 The Venus Genetrix style of statue depicts Aphrodite (Venus to the Romans) as Genetrix ( Latin for Mother). This sculptural type was adopted by the Julia-Claudian dynasty after Julius Caesar claimed that he was defended from Venus herself. The original lost Greek statue is attributed to Greek sculpture Callimachus who created a Bronze Aphrodite in 420-410. According to Pliny's Natural History showing her dressed in a light but clinging chiton or peplos, which was lowered on the left shoulder to reveal her left breast and hung down in a sheer face and decoratively carved so as not to hide the outlines of the woman's body. Venus was depicted holding the apple won in the Judgement of Paris in her left hand, whilst her right hand moved to cover her head. From the lost bronze original are derived all surviving copies. The composition was frontal, the body's form monumental, and in the surviving Roman replicas its proportions are close to the Polyclitean, an ancient Greek sculptor in bronze of the fifth century BC.